Flowermaking author Cindy Oravecz does it again, introducing a new bias technique for easy, flawless applique done in a flash. 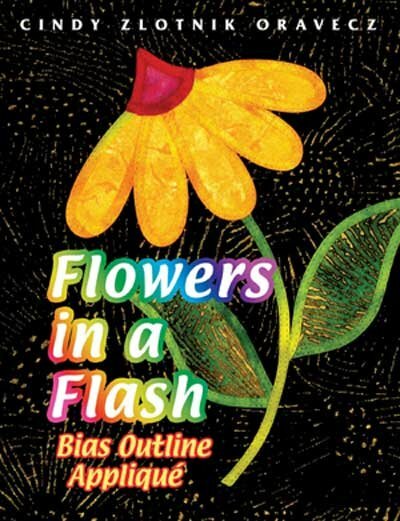 "Flowers in a Flash, Bias Outline Applique" is a book filled with beautiful flowers. It is an inspiring quilt book for all levels. 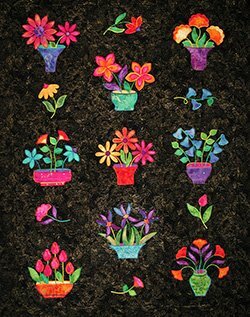 All the colors of the rainbow come to life in a spellbinding array when set against the black background fabrics seen through the full-color pages of this soft cover book. Full color, step-by-step photographs walk stitchers through twelve different projects using quick fused fabric and fused bias to create outline applique. Fusible bias tape simply outlines fabric shapes. Quilt using a double machine needle. Projects include The Rainbow Sampler Quilt and Wallhanging, Easy-to-Embellish Purse and Shirt, Sliced Pickles, Castle Window, Stained Glass Hearts, Stained Glass Pine Trees and other wallhangings and potholders.